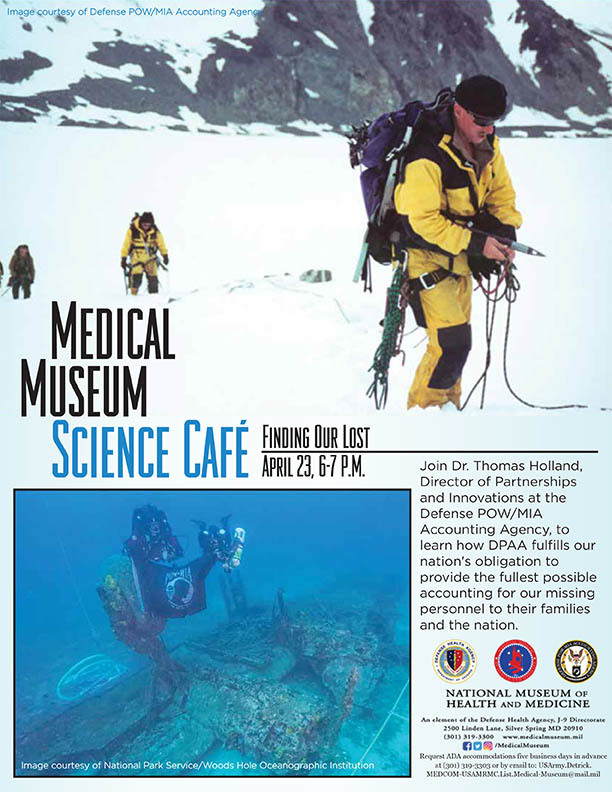 When: Tuesday, April 23, 2019, 6-7 p.m.
Join Dr. Thomas Holland, Director of Partnerships and Innovations at the Defense POW/MIA Accounting Agency, to learn how DPAA fulfills our nation's obligation to provide the fullest possible accounting for our missing personnel to their families and the nation. FREE! Open to the public. No RSVP required. Request ADA accommodations five business days in advance at (301) 319-3303 or by email to: USArmy.Detrick.MEDCOM-USAMRMC.List.Medical-Museum@mail.mil. **NMHM events are subject to change. Follow NMHM on Facebook and Twitter for updates. This Web site provides an introduction to the National Museum of Health and Medicine (NMHM) and contains official Government information. Its use is intended for members of the general public, news media and Army Medical Department beneficiaries.